Appellation or Vine Cortinie Bianco I.G.T. This wine, full of character, comes from selected individual vineyards stocked with vines grafted to slow growing rootstock and trained on wire trellises (Guyot) or on the pergola. The grapes of this cuvèe grow under the best conditions on the valley floor around the village of Cortina. The favorable location of the vineyards, the ideal amount of sun, and the fine ventilation of the vines assure the ripening of grapes of exceptional quality. A medium hue and a very rich bouquet give the clear impression of having found a wine of conspicuous harmony. The colour oscillates between straw-yellow and golden yellow. 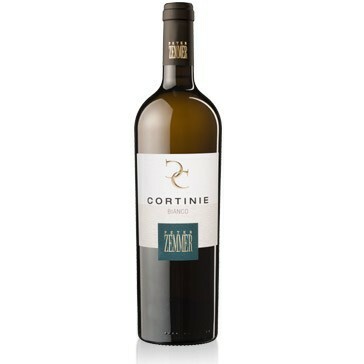 It has a strong bouquet of ripe fruit with a variety of aromas (apricots, tropical fruit, vanilla). The flavour is strong, balanced, and savory, an interesting play of acidity in the mouth, harmoniously juicy and rich with a pleasant fullness. Appetizers, fish and vegetable-based main dishes, white meats.